Below is my story about getting a soft reline done. I tried holding out until my appt on 5-24 but the pain of the denture cutting into my gum was getting worse. I didnt want to wait too long and it become so bad that I couldnt wear the denture. Thought it would be best to call the dentist and see what he said. 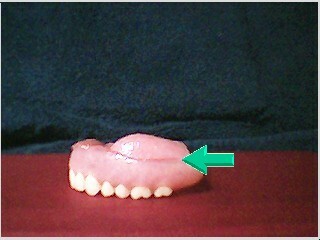 Below you will also see pics of the denture afterwards. I haved used arrows to point to the areas that were adjusted. You will notice a difference in color from the detnure and reline material. I called my dentist to see if he could see me because of the pain from the denture cutting into the area where the top lip meets the gum line. I talked to his receptionist. I told her the problem I was having. She told me "OH we need to see you right away can you come in tomorrow at 12." I was very pleased they wanted to see me right away. I went in the next day. 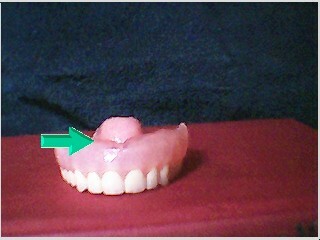 I didnt use adhesive that morning, wanted it to be easy to remove the denture when I got to the office. They asked me how I was. I told them I was doing fine all except they were falling out of my mouth without adhesive and that the plate was now going so far up ,since the swelling had went away, that the denture was cutting into the soft tissue where the lip met the top of the gum line. It was leaving a nice red line where it was rubbing. They told me well we will take care of all of that today. He started by looking around to see where the denture was rubbing while it was still in my mouth. He then removed the denture and said he would be right back he was going to trim it down some. He came back he had really trimmed it. But then it looked like the edges would be REALLY painful. He told me that he would be doing a soft reline. I thought what I had done at the three week mark was the soft reline. Found out real quick it was NOT! He told me that he would be putting a gel type stuff on the denture and then placing it in my mouth. It would take about 5 minutes for it to set. 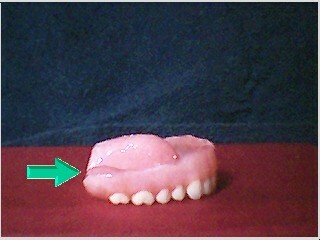 They then would remove the denture and trim away any excess. I watched him put the goo on the denture. It reminded me of a chaulking gun. He spread it all around the plate of the denture. They popped it in my mouth. Boy that stuff felt tight. After it had set he went to remove it. OH boy he was pulling from the front of the denture. It hurt!! It was pulling on one of the sockets that had to have stitches at the beginning of all of this. Well the pressure of that was really hurting. I guess he could tell because he leaned back and asked would you rather take it out, you probably have a certain way to remove your denture. I used my fingers on the sides to remove it and it popped right out. WHEW! He then showed me how it all looked now. 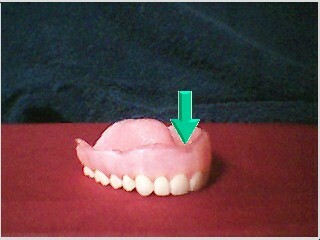 I had a nice cushiony area around the edge of the denture and cushiony areas where the gums rest inside the denture. It fit like a glove. He told me that you should have a lot better fit now. I asked him about brushing it etc. He told me that I could continue to brush and soak the denture like I was before. He asked which type of adhesive I was using. I told him the powder why? He said that if I needed to use adhesive again before I saw him that the powder would be fine but that the paste type adhesive sometimes pulls the soft reline material away with it when you go to clean it. Well another plus for the powder lol. He told me that everything was healing really well. That I wouldn't need to come back for 8 wks. But that if I had any problems to feel free to call his office to make an appt before that time. I was so happy leaving his office. I had taken my adhesive with me just in case I needed it after the appt. Well I didnt. I had that appt on 5-6 and its now 5-10 and I havent used any adhesive since. I know that some more healing will probably take place and I will have to use the adhesive again but for now I am in HEAVEN!!!!! In the next text section I will detail how it was once I got home after the reline. I got home from the dentist. Had to pop it out and look it over. The reline material reminds me of silicone around a window or bathtub. It was real cushiony. I could see where he had cut it back so it wouldnt be so big and then the reline material coated the edges so it wouldnt cut into my gums. It was also all inside the gum area of the denture. It felt really wierd. It had little cushiony points where it had set into the healing gums. It didnt hurt a bit in my mouth. Well I popped it back in. Carried on thru my day. Waiting on dinner time. I wanted to see how it would be to eat now. I managed to eat a chicken breast that night for dinner. I could chew on both sides of my mouth. I could bite with them. I wasn't using any adhesive. It was great!!!! At bedtime I took them out trying to be real careful where it was relined. I didnt want that material to come off. I then soaked them overnight. The next morning I went to pop them back in. It was a little difficult. It felt like it would press on my healing gums when I tried to push it back up into my mouth. I was scared it was going to really hurt then make it to where I could not put it back in. I took a deep breath and pushed the denture up into place. There was a little discomfort pushing it up over the gums but once I got it up there. It was a perfect fit again. Whew!! Thank goodness. I guess overnight the gums rest somewhat and feels a little too tight when putting it back in the morning. I am now 4 days into the soft reline so I am used to the akwardness the next morning. The rest of the day is like heaven. I can eat, bite, chew, talk soooo much better now. I even managed to really Kiss my hubby. I thought I was doing better before now its like it was before. I dont have to hold back at all. Can really bear down and give my hubby a deep loving meaningful kiss. I can even nibble on my hubbys lips!! I even managed some intimate experiences with my husband that I was wondering if I would ever be able to do again. You will have to read between the lines on this subject. I am not going to make my site vulgar. My hubby was really shocked during our private time. He looked at me and said OHHH I take it your mouth is feeling much better. I was really pleased with myself. I am feeling just like my old self again. YEAA!!!! I am so PLEASED with my denture at this point. I am so happy I have finally made it this far. I can do just about anything I was able to do before. I am a bad lip biter. If there is a chapped part of my lip with skin I have to bite it off with my teeth. Well I was unable to do this for the longest time. It was driving me crazy. Was addicted to chapstick lol. Well I had a little bit of skin that I could feel with my tongue. I decided well let me see if this reline helped. YEA I was able to bite it off with my denture. That maybe gross to some but to those lip biters out there they totally understand where I am coming from lol. The only thing I am still unable to do is use my denture as a tool. By that I mean to bite open a bag of chips or something like that. I think that will come with time. I can deal with having to use scissors etc. Just to be able to bite, eat, chew, kiss, whistle, all normally is enough for me!! If anyone can think of anything that I forgot to discuss feel free to contact me.